The moon is full and according to Facebook it is the GREEN MOON. But I can’t see it as it is April and the rains have begun. I don’t mind the sleepless full moon energy though it robs me of my sleep. I can lay here in my round mud hut. I do love it- this little house. It is made of the mud bricks taken from the digging of a cistern. So marking out a 14 foot diameter circle, the work began. Bricks about to neck height then screening all the way around, topped off with pole and a thatch roof. A perfect touch was the yellow bamboo grills to protect the screen. What a marvelous feeling in this little house. Something about round. Something about earth and grass. Something about the rough stone floor. To appease the Kenyan modesty, a dividing curtain was hung and drawn up to divide the room into two sleeping spaces, when necessary, and another to divide off a small dressing room. Oh how that fabric added another precious touch. The inside of the bricks have been plastered and painted. 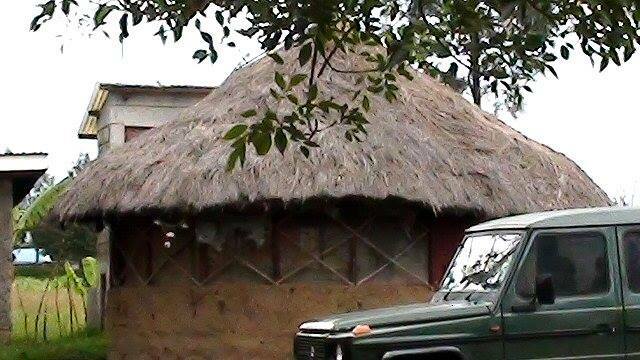 The roof is thatch inside and out. A fresh breeze wafts through the open screens. The rain on the roof tonight is soft and steady. A sweet sound bringing the moist smell of the sprouting beans, maize and sukuma. I lie here on my mattress with the hole shaped like me and in the dark, listen to the rain in utter relaxation. I don’t need to think about not sleeping. I don’t need to think about tomorrow. I can drink in each moment of NOW.